There are different types of educational technology (“Facilitate”, “Communicate”, “Administrate”) — The technology has to be tailored to the specific context — How do we assess student learning with technology? — Are students learning more content, or more digital skills? —When we assess success or failure of a tool, is it because of the tool itself, or because of the context? — We have to experiment: try something for a semester, see if it works — There are lots of different ways of getting started with new tools (DigLibArts site, Google, DigLibArts staff, one’s colleagues). Like Digital Stories, Infographics are essentially a method for distilling and communicating large amounts of information in a constrained format. Before students can produce an effective infographic they must first be strong researchers and writers with a grasp of relevant literature, and the argument or task that they want to accomplish. Then, they need to be able to recognize and evaluate rhetorical strategies of infographics (both the effective and ineffective ones), break down their components, and reverse engineer them. We also recommended allowing sessions for students to map out their infographics manually (a.k.a. analog prototyping), composing digitally, sharing drafts and getting feedback before submitting a final version. At DigLibArts we like using Piktochart, a free browser-based infographic and poster composition tool. It isn’t necessarily the right choice the right choice for most posters (especially in STEM), as PowerPoint is a more standard choice for large print posters. Often, though, large posters can be cost-prohibitive, and their format even more rigid, which may make infographics more flexible as they can be shared and distributed digitally. Course websites can serve as important spaces to archive classwork in case students want to use it again later. Having classes in different spaces (galleries, small groups, study abroad) can promote creative ways of sharing infographics and posters by adding another dimension of space and performance. 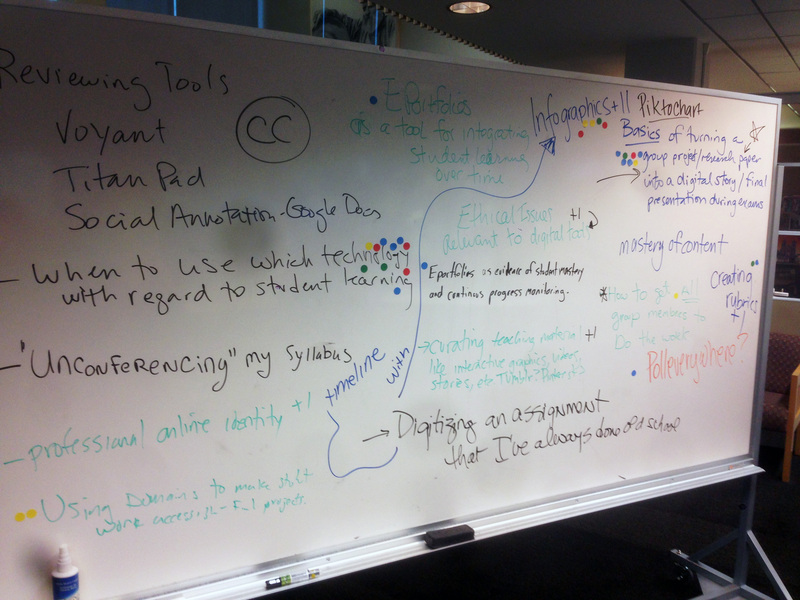 A major question that came up in our group: How do we assess digital assignments and how do assess group work? We shared rubrics, discussed collaborative rubrics, self-evaluations, setting expectations, etc. but came to the conclusion there is no “right” way to evaluate such work. First students have to learn their topic; then learn to condense it; then make a storyboard — The process is intensive, requiring three visits to the Collaboratory, and the teacher should learn to use the technology as well — Digital storytelling may not work well as a simple alternative to a term paper; they may need to be more deeply integrated into the course design — How does attribution work within student work? — Do they use licensed images responsibly or credit them? We also got requests on Monday for additional resources for teachers just getting started with newer digital technologies. We already have many of these resources in our Teaching Repository, and we plan to write up additional beginner materials in the near future.